The shoulder joint, or the glenohumeral joint, has the widest range of motion compared to any other joint in the body. This range of motion, however, is at the sacrifice of stability. The joint is therefore stabilized by static stabilizers, such as the shoulder joint cavity (by its shape, size, and orientation), and dynamic stabilizers (such as the rotator cuff muscles). The inherent instability makes the shoulder joint susceptible to subluxation (partial dislocation) and dislocation injuries. A dislocated shoulder most frequently occurs as the shoulder is forced away from the midline of the body and externally rotated, causing the head of the upper arm to push forward and out of the joint. Lesions developed due to the first trauma can result in chronic instability. 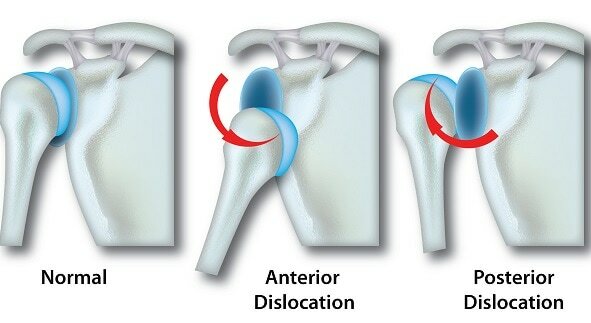 Over 95% of all shoulder dislocations are anterior, that is the head of the upper arm dislocates to a more forward position, rather than behind the body which would be posterior. Young adult men, between the ages of 16 and 30 years old, are at the highest risk of a dislocated shoulder, and it usually occurs from high impact events; 90% of patients are reportedly between 21 and 30 years of age. Men are also 3 times more at risk than women. Recurrent injury has also been found to have a strong correlation with age, with 66-100% of persons 20 years or less, 13-63% of persons between 20 to 40 years and 0-16% of persons over 40 years reporting recurrent injuries. This high level of recurrence in adolescents is due to the collagen profile in the capsule and tissues of the shoulder in the young population, which changes with age. The nature of the initial injury is also related to risk of recurrence (1-3). This is a major risk factor. Individuals in their second and sixth decade of life are at the highest risk. Men are three times more likely to have a dislocated shoulder than women. Diagnosis of a dislocated shoulder can be made after observing the symptoms mentioned above accompanied with the use of imaging techniques such as radiography. The integrity of the nerves and blood vessels must also be considered before attempting to relocate/reduce the affected shoulder. Damage to the bone must be assessed using X-ray imaging, as this will determine what reduction technique is safe for the patient. For patients suffering from recurrent dislocation, arthroscopic visualization is the diagnostic technique typically utilized. Computed tomography (CT) and MRI scanning can also be used and are acceptable non-invasive alternatives. It is crucial that a dislocated shoulder is treated as soon as possible, as failure to reduce or relocate the injured shoulder within 24 hours may consequentially make it impossible to achieve a stable reduction/relocation. There are different techniques of reduction, but success depends on the skills of the surgeon and the analgesics used. After reduction, a radiograph should be obtained to ensure that the reduction was successful and determine if there were any associated fractures. In one study, it was found that 37.5% of fractures were visible only after reduction. Re-evaluation of nerve and blood vessel integrity should be also done before deciding on a treatment regimen. If there is no other injury that needs to be managed, conservative treatment such as activity modification, physical therapy and immobilization can be sufficient for first-time cases. The dislocated shoulder is usually immobilized in a sling internally rotated towards the body midline. Some studies have claim that external rotation of the shoulder produces better results, although this too has been challenged. One of the most challenging aspects of external rotation is patient compliance and ability to function with external rotation of the injured shoulder. This technique is therefore not generally accepted. Immobilization can last for a little as a few days to up to several weeks. If there are other injuries present, such as nerve damage, damage to blood vessels or fractures, these may require separate treatment and may complicate the management of the dislocated shoulder. Depending on the nature of the injury, or if the patient suffers from recurrent dislocations, surgery may be recommended. Open surgery, which is the gold standard, and the more modern, less invasive arthroscopic surgery can be considered. The latter however requires high technical skill and the use of expensive equipment (4). Arliani GG, Astur Dda C, Cohen C, Ejnisman B, Andreoli CV, Pochini AC, et al. Surgical versus nonsurgical treatment in first traumatic anterior dislocation of the shoulder in athletes. Open Access J Sports Med. 2011;2:19-24. doi: 10.2147/OAJSM.S17378. PubMed PMID: 24198566; PubMed Central PMCID: PMCPMC3781878. Khiami F, Gerometta A, Loriaut P. Management of recent first-time anterior shoulder dislocations. Orthop Traumatol Surg Res. 2015;101(1 Suppl):S51-7. doi: 10.1016/j.otsr.2014.06.027. PubMed PMID: 25596982. Mays PK, McAnulty RJ, Campa JS, Laurent GJ. Age-related changes in collagen synthesis and degradation in rat tissues. Importance of degradation of newly synthesized collagen in regulating collagen production. Biochem J. 1991;276 ( Pt 2):307-13. PubMed PMID: 2049064; PubMed Central PMCID: PMCPMC1151092. Cutts S, Prempeh M, Drew S. Anterior shoulder dislocation. Ann R Coll Surg Engl. 2009;91(1):2-7. doi: 10.1308/003588409X359123. PubMed PMID: 19126329; PubMed Central PMCID: PMCPMC2752231.